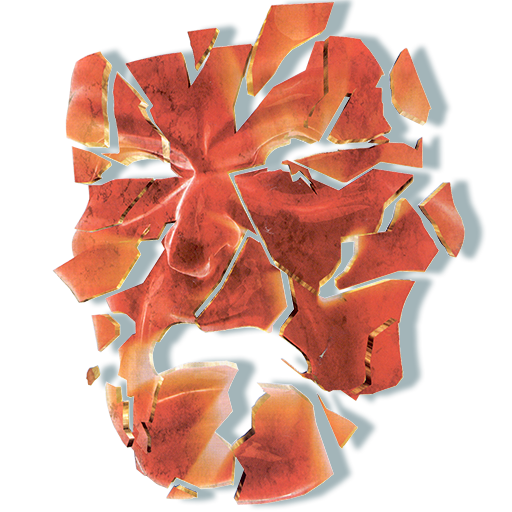 When an individual takes part in the RPF, he is thoroughly engaged in redeeming himself spiritually by fully handling the underlying causes of his destructive actions. As with any intensive religious endeavor toward rehabilitation, the attention of the individual must not be dispersed into other activities. All efforts should be expended purely on becoming a full product of the RPF. As covered in RPF Series 19, WAIVERS FOR THE RPF, an individual must read all the RPF Series and agree to follow them before he may be allowed to start the RPF program. Undertaking the RPF program, with its attendant restrictions and disciplines, is done voluntarily. The person has the option of doing the RPF and adhering to its rules, or not accepting the opportunity for redemption and terminating his membership in the Sea Organization. The RPF program is for the individual’s rehabilitation, and the more rapidly he gets through it, the sooner he becomes a contributing member of the full group—and the group welcomes that occurrence. With this purpose in mind, the rights and restrictions for all RPF members are enumerated here, to be complied with unreasonably. 1. 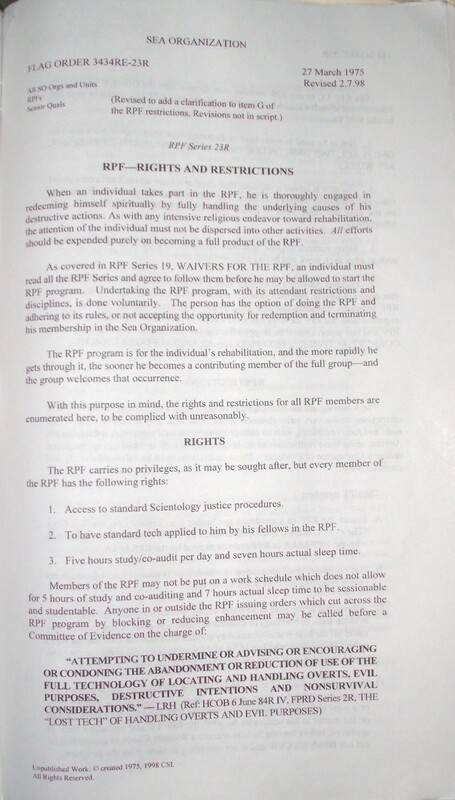 Access to standard Scientology justice procedures. 2. To have standard tech applied to him by his fellows in the RPF. 3. Five hours study/co-audit per day and seven hours actual sleep time. Unpublished Work © created 1975, 1998 CSI. RPF I/C or any RPF member may directly alert the Office of Senior C/$ International to such a situation if it occurs and when the RPF 1/C cannot or does not handle such locally. 6. Thirty minutes hygiene time which must be used for hygiene and clean-up such as after deck work and before enhancement time. The following are the restrictions that apply to all members of the RPF. These restrictions define very strict channels so the individual may intensely work, study, audit and receive auditing with no outside distractions until complete on the program. Anyone using these restrictions to cause hardship to staff is subject to investigation and/or a Committee of Evidence. These restrictions must be followed exactly and constructively. B. Has no liberty until graduation at which time is awarded a 24-hour liberty before reporting for duty at his or her org. C. Is restricted to the base at all times except when on authorized work cycles in other areas or buildings or authorized medical or other urgent cycles. Any travel off the base is accompanied by another staff member (outside the RPF) or an RPF member who has MAA and Security okay. This rule is not to be used to prevent staff from handling real situations where they occur. 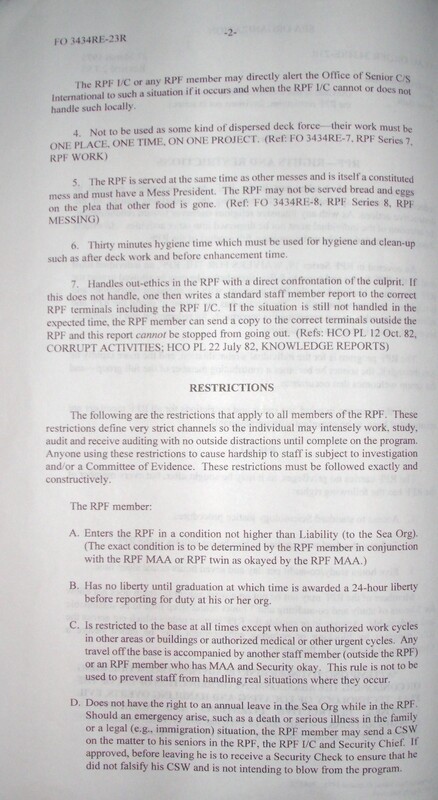 D. Does not have the right to an annual leave in the Sea Org while in the RPF. Should an emergency arise, such as a death or serious illness in the family or a legal (e.g., immigration) situation, the RPF member may send a CSW on the matter to his seniors in the RPF, the RPF I/C and Security Chief. If approved, before leaving he is to receive a Security Check to ensure that he did not falsify his CSW and is not intending to blow from the program. E. Receives ¼ allowance while in the RPF and is not eligible for bonuses. 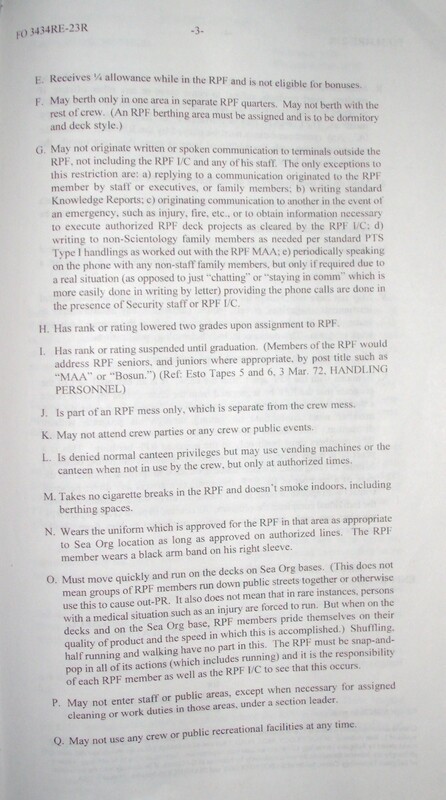 G. May not originate written or spoken communication to terminals outside the RPF, not including the RPF I/C and any of his staff.The only exceptions to this restriction are: a) replying to a communication originated to the RPF member by staff or executives or family members; b) writing standard Knowledge Reports; c) originating communication to another in the event of an emergency, such as injury, fire, etc., or to obtain information necessary to execute authorized RPF deck projects as cleared by the RPF I/C; d) writing to non-Scientology family members as needed per standard PTS Type I handlings as worked out with the RPF MAA; e) periodically speaking on the phone with any non-staff family members, but only if required due to a real situation (as opposed to just “chatting” or “staying in comm” which is more easily done in writing by letter) providing the phone calls are done in the presence of Security staff or RPF I/C. H. Has rank or rating lowered two grades upon assignment to RPF. J. 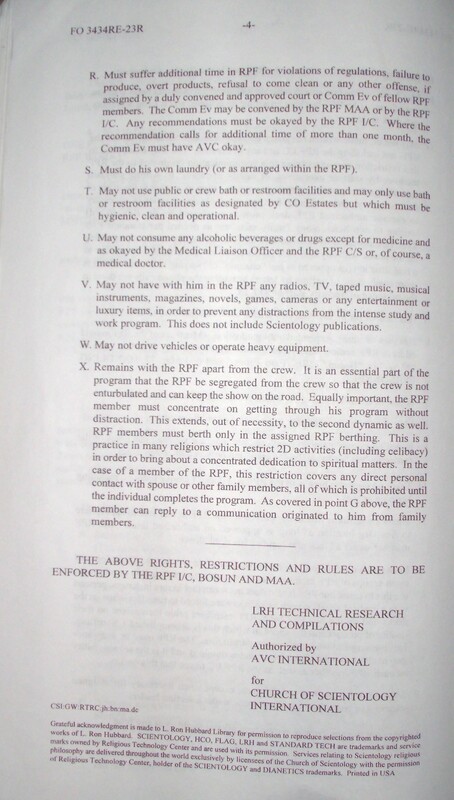 Is part of an RPF mess only, which is separate from the crew mess. K. May not attend crew parties or any crew or public events. L. Is denied normal canteen privileges but may use vending machines or the canteen when not in use by the crew, but only at authorized times. M. Takes no cigarette breaks in the RPF and doesn’t smoke indoors, including berthing spaces. N. Wears the uniform which is approved for the RPF in that area as appropriate to Sea Org location as long as approved on authorized lines. The RPF member wears a black arm band on his right sleeve. O. Must move quickly and run on the decks on Sea Org bases. (This does not mean groups of RPF members run down public streets together or otherwise use this to cause out-PR. It also does not mean that in rare instances, persons with a medical situation such as an injury are forced to run. But when on the decks and on the Sea Org base, RPF members pride themselves on their quality of product and the speed in which this is accomplished. Shuffling, half running and walking have no part in this. The RPF must be snap-and-pop in all of its actions (which includes running) and it is the responsibility of each RPF member as well as the RPF I/C to see that this occurs. P. May not enter staff or public areas, except when necessary for assigned cleaning or work duties in those areas, under a section leader. Q. May not use any crew or public recreational facilities at any time. S. Must do his own laundry (or as arranged within the RPF). T. May not use public or crew bath or restroom facilities and may only use bath or restroom facilities as designated by CO Estates but which must be hygienic, clean and operational. U. May not consume any alcoholic beverages or drugs except for medicine and as okayed by the Medical Liaison Officer and the RPF C/S or, of course, a medical doctor. V. May not have with him in the RPF any radios, TV, taped music, musical instruments, magazines, novels, games, cameras or any entertainment or luxury items, in order to prevent any distractions from the intense study and work program. This does not include Scientology publications. W. May not drive vehicles or operate heavy equipment. X. Remains with the RPF apart from the crew. It is an essential part of the program that the RPF be segregated from the crew so that the crew is not enturbulated and can keep the show on the road. Equally important, the RPF member must concentrate on getting through his program without distraction. This extends, out of necessity, to the second dynamic as well. RPF members must berth only in the assigned RPF berthing. This is a practice in many religions which restrict 2D activities (including celibacy) in order to bring about a concentrated dedication to spiritual matters. In the case of a member of the RPF, this restriction covers any direct personal contact with spouse or other family members, all of which is prohibited until the individual completes the program. As covered in point G above, the RPF member can reply to a communication originated to him from family members. THE ABOVE RIGHTS, RESTRICTIONS AND RULES ARE TO BE ENFORCED BY THE RPF I/C, BOSUN AND MAA.